Why Are Our Prices Different? If you're reading this, you are likely in the market for a new car and doing a lot of research. Depending on where you are looking, you may have noticed multiple prices for the same vehicle. For instance, TV commercials may advertise a 2018 Toyota Corolla differently than the pricing you may see on a website. This may lead to some confusion but the reason is pretty simple. Many commercials will only show you the MSRP of the vehicle (Manufacturer's Suggested Retail Price). The MSRP is set by the Manufacturer, in this case Toyota, as a suggested price to sell the vehicle at and is the only price that legally has to be shown. 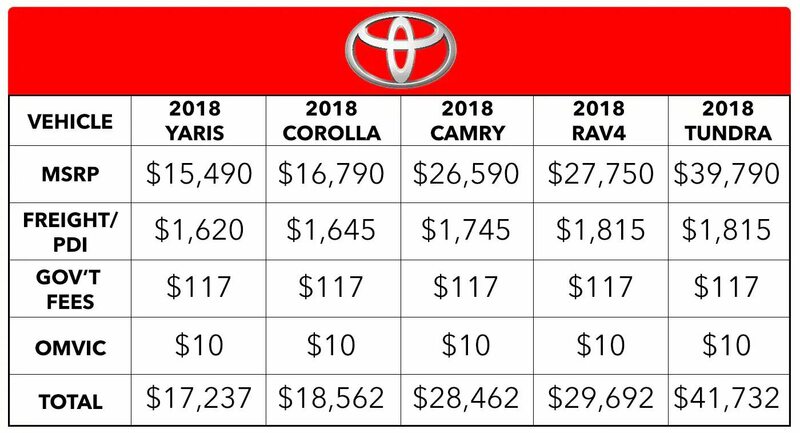 However, at Markville Toyota, we want to be up front about our prices, which is why we choose to include all fees in our pricing. What Do Our Prices Include? In Ontario, all dealers must advertise their pricing according to OMVIC (Ontario Motor Vehicle Industry Council) regulations. One of those laws is, we must advertise the "All-In Price", which is MSRP (Manufacturers Suggested Retailing Price) plus all applicable fees and levies such as Freight & PDI, the Environment Handling Fee, OMVIC Fees and Tire Levies. Not all advertising always complies with this law and sometimes you will just see MSRP Advertised. All dealers will charge the "All-In Price", but you might not know that until you're sitting at the negotiation table. At Markville Toyota, it has always been our policy to be upfront, honest and clear about our pricing. See the graphic above for a complete breakdown of pricing. The Environmental Handling Fee is comprised of two portions: 1) Stewardship Ontario Oil Filter Fee and 2) Stewardship Ontario Tire Fee. The Stewardship Ontario Oil Filter Fee is either $0.50, or $1.00 depending on the size of the filter. Filters <8" in diameter carry a charge of $0.50, and Filters >=8" in diameter carry a charge of $1.00. The Stewardship Ontario Tire Fee is $5.84 for each commercial tire. If your vehicle comes with 5 tires, the total fee would be $29.20. Together these are referred to as an EHF Fee, and commonly comes to a total of $30.20. Part of the fees that are charged to you are the Tire Levies. This is an Eco fee that ensures that the end of your tire's life is handled as eco-friendly as possible. This fee goes towards provincial tire programs that collect, recycle and reuse old tires. This includes any shipping and storage of the tires as well as the operation of the recycling depots. OMVIC stands for Ontario Motor Vehicle Industry Council. OMVIC's mandate is to maintain a fair, safe and informed marketplace by protecting the rights of consumers, enhancing industry professionalism and ensuring fair, honest and open competition for registered motor vehicle dealers. Dealers are required to remit $5 for applicable transactions as of February 1, 2008. The applicable date for determining whether a particular transaction is subject to the transaction fee is the date the agreement with the customer was entered into (i.e. not the date the vehicle is delivered or the date registration is transferred to the customer). The Ontario Motor Vehicle Industry Council enforces the Motor Vehicle Dealers Act (MVDA). "As the regulator of motor vehicle sales in Ontario, OMVIC's mandate is to maintain a fair, safe and informed marketplace by protecting the rights of consumers, enhancing industry professionalism and ensuring fair, honest and open competition for registered motor vehicle dealers. It's important car buyers understand the protections and rights they have depends entirely upon whom they buy from. Consumers who purchase from registered dealers are protected by OMVIC and are entitled to full disclosure and all-in pricing. Consumers who buy privately have NO protection; no consumer law covers private transactions." "Afford" a nicer car. If you've ever wondered how it is that so many people can afford to drive an Avalon or 4Runner, then wonder no more. According to LeaseGuide.com, around 75% of all luxury cars are leased. The reason is because banks don't like to loan out more than $30,000 for a car loan. If you want a car that's worth more than that and you don't have the money to make up the difference, leasing is your only option. On the upside, your monthly payment will be lower than if you actually bought a car. Leasing allows you to "afford" a nicer car than you'd get if you had to buy it.